[ABRAHAM LINCOLN]. HENRY W. BELLOWS. 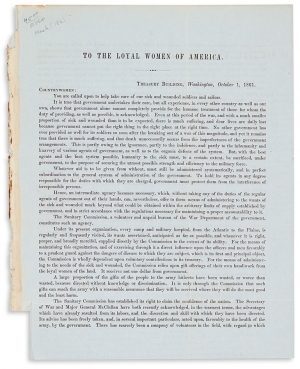 Printed Circular Letter, to “the Loyal Women of America.” Washington, D.C., October 1, 1861. 3 pp., 8 x 10 in. The United States Sanitary Commission (USSC) was a private relief agency to support sick and wounded Union soldiers and sailors. The idea began at a meeting of the Women’s Central Relief Association of New York in April 1861, and was modeled on the British Sanitary Commission, which operated during the Crimean War. The USSC set up and staffed hospitals, and operated thirty soldiers’ homes, lodges, and rest houses for traveling and disabled Union soldiers. This circular urges American women to send contributions to the USSC for distribution to suffering servicemen. “Every woman in the country can, at the least, knit a pair of woolen stockings,” the letter declared, “or, if not, can purchase them.” The USSC sought blankets, quilts, pillows, slippers, delicacies such as cocoa and dried fruit, checker and backgammon boards, and books and magazines for convalescing soldiers and sailors. Before it was printed, Frederick Law Olmsted wrote to Lincoln requesting “a line from the President recommending the purpose of the Commission to the confidence of the public.” Lincoln’s response, sent the same day, is included at the end. 7,000 affiliated local societies held bazaars, concerts, raffles, and plays to raise money. Beginning in the fall of 1863, major cities—including Chicago, Cincinnati, Brooklyn, New York, Pittsburgh, Philadelphia, St. Louis, and Boston—held large sanitary fairs that lasted for weeks. With donations from many famous figures, and artifacts for sale such as signed copies of the Emancipation Proclamation, over the course of the war, the USSC raised an estimated $5 million in cash and $15 million in in-kind contributions. At first, the Army Medical Bureau resented civilian involvement and questioned the use of women as nurses. Similar groups such as the Christian Commission argued that their counterparts were more interested in providing something for the upper classes to do in the war, aside from fighting, than they were in sympathizing with the plight of soldiers. But its success silenced most critics over time. The USSC did provide significant opportunities for women to participate in the war effort. Dorothea Dix, Mary Livermore, and Mary Ann Bickerdyke held leadership roles. Novelist Louisa May Alcott was a nurse in a USSC hospital. One of its nurses, Clara Barton, became a founder of the American Red Cross. Many of the Northern women who were its grass roots workers developed an involvement in philanthropic and public affairs, including the Civil Rights and Women’s Suffrage movements. Henry W. Bellows (1814-1882), born in Boston, graduated from Harvard College in 1832 and Harvard Divinity School in 1837. In 1839, he became the pastor of the First Congregational church in New York City. Gaining a reputation as a pulpit and lyceum speaker, he became a leader of the Unitarian Church in America. From 1847 to 1866, Bellows edited the Christian Inquirer, a weekly Unitarian newspaper. Bellows planned the United States Sanitary Commission and served as its only president from 1861 to 1878. In 1877, he became the first president of the first Civil Service Reform Association. Frederick Law Olmsted to Abraham Lincoln, September 30, 1861, Abraham Lincoln Papers, Library of Congress.